Curious, active, and gregarious coatis are very social animals, living in bands of up to 30 or more. 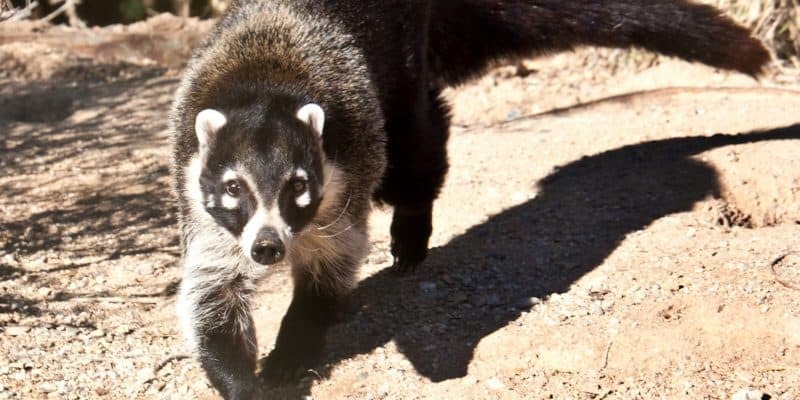 Also known as ‘Coatimundi’, or ‘White-Nosed Coati’ and a member of the raccoon family, the coati is a curious-looking animal, longer than a raccoon, with a long nose and a facial mask. A slender animal with a long, banded tail which is carried erect, coatis have short legs and a long, pointed snout. They are grizzled brown to yellowish-brown in color. Like the raccoon and ringtail, coatis forage both on the ground and in trees, and are omnivores. Length: 2 ½ – 4 ½ foot; up to 10 inches in height. Tail: 2 – 3 foot carried vertically. Weight: 7 – 20 pounds. Males are almost twice as large as females. Habitat: Oak-grasslands, higher deserts and canyons. In Sabino Canyon, coatis favor oak sycamore and riparian areas. Being omnivores, coatis seem to have an insatiable appetite for frogs, lizards, insects, fruits, nuts, and eggs. Their stout claws and long snout work together for food gathering. They have an excellent sense of smell and will be seen sniffing along the ground. Although excellent climbers, coatis spend most of their time on the ground hunting. Coatis are diurnal, active mostly in the morning and late afternoon, then spending the night in trees or rocky niches. Curious, active, and gregarious coatis are very social animals, living in bands of up to 30 or more. The bands consist of females and their young. Adult males are not welcome, except during mating season, although lone males may follow a group at other times. Coatis mate in early spring and deliver a litter of 4 – 6 young after a gestation period of about 11 weeks.